Part 3, Race Kick: Tips And Workouts For Shifting Gears | Run S.M.A.R.T. During championship races and/or qualifying events, races are often unpredictable as the finishing position is more important than the time. This is another reason why runners should not obsess with lowering their personal records (PRs) but instead focus on developing their abilities to beat people. It is very possible for a runner to run fast in perfect conditions but fail to win a medal at the most important meet of the year. 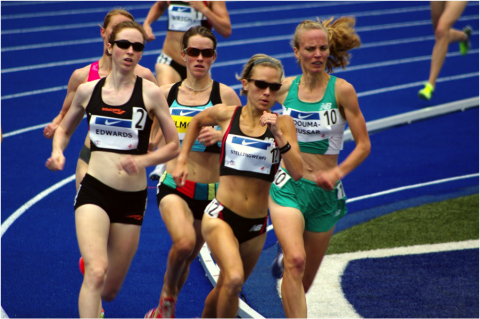 Steve Magness has some great workouts outlined that he uses with his athletes and I have a few favorites that I felt helped me hone my racing chops. These workouts train the body to “kick” off of different paces and not simply teach the body to run the same pace all the time. The reality of racing and training can be vastly different and it is important to teach the body how to change gears. Run the first 400m a little slower than 1500m race pace and then a significant “change of pace” is required for the last 200m. This should be several seconds faster than the first 400m. For example, if the 400m race pace is 70 seconds, the final 200 should be low 30s. Beware, lots of rest (5-6 minutes) is needed to keep the quality of this session! Even though the total volume is low, the load on the body is high and you should feel wiped by the end. Volume and mileage should not be a goal in this workout session! Another great workout that I would often do as a sharpening workout in the 10 days prior to a championship race (Nationals) includes descending intervals with a kick finish. The first part would be quick (800 to 1500m pace) and the last part would be AS FAST AS POSSIBLE (AFAP). The AFAP segment would change with each interval so that I could mentally practice making a move at different parts of the race. This is a dynamic and hard workout and includes many elements, including pace work, change of pace, and sprinting. It is also a low volume workout but should leave you with your hands on your knees by the end of it but should allow you to build the finishing kick of your dreams! With 50 meters remaining in the race, the top 3 finishers were starting to pull away. In order to win the race at the line, I had to use all my tools: psychological, strength and speed.